Ski the slopes of the Mid-Atlantic’s premier snow resort and surf an endless wave all in the same day at Massanutten Resort.This four-season resort set in the Shenandoah Valley of Virginia, boasts year-round activities including golf, tennis, horse-back riding, zip-line, rafting, fishing, ice skating and snow tubing, plus a 42,000-square-foot, indoor/outdoor waterpark. We practically had the waterpark all to ourselves in the off-season of October, which meant numerous trips down each of the park’s body slides and tube slides; five in total. It also meant no lines at The Pipeline – a continuous surfing wave – the first and biggest FlowRider® in Virginia. Our five-year-old loved the thrill of riding the gushing waves over and over again. After my first and last attempt I offer you this tip: wearing a one piece suit is highly recommended. More slides for all ages are part of the central feature of the park: the Massanutten Meltdown. 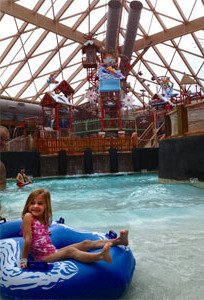 Climb to the top of the structure through numerous waterfalls and plan your escape down a slide before the giant water bucket at the top tips and drenches everyone in its’ path. There simply is no way to not get wet once inside the Meltdown. After all that action, it was nice to just float peacefully for a while down Blue Ridge Rapids – a winding lazy river with zero-depth entry. Our favorite place to chill together as a family is always the hot tub. The indoor/outdoor Shenandoah Hot Springs family hot tub was the perfect retreat at the end of our water park adventure. Three dining options, and a state-of-the-art arcade are also right there at the WaterPark, so you can easily spend your entire day having fun. We haven’t done the indoor water park yet. I don’t know what we’re waiting for, this looks like a lot of fun. Especially on a slow park day!